Mercedes-Benz Fashion Festival Brisbane, Australia S/S12: Jordanna Regan. True Fashionista Now > Uncategorized > Mercedes-Benz Fashion Festival Brisbane, Australia S/S12: Jordanna Regan. 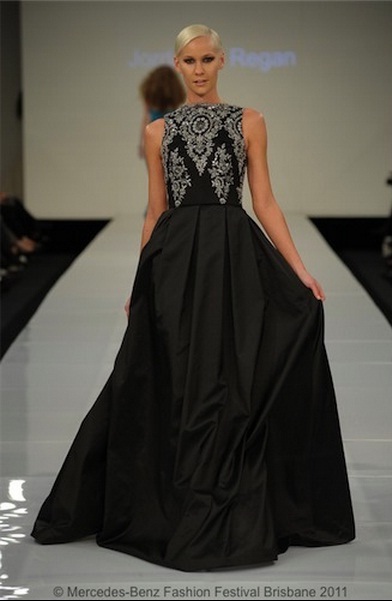 Check out these gorgeous evening gowns by Aussie designer Jordanna Regan. I love the sequinned embroidery, and I must confess I am not a sequin fashion fan. The reason I love it here though is because Jordanna’s minimal and geometric motif use of sequins on her looks, is very tasteful. It’s almost like she creates shapes to flatter body types, hence check out the first look with the vertical lined sequins, that create a slimming and long body type. Follow and connect with us on Facebook for more pics and fashion news. Giambattista Valli Pre-Fall 2013 Collection. Copenhagen Fashion Week: Margrethe-Skolen S/S 2013. Poplyfe Is Talent With Fashion Sense. Love the second from top. Is that a laser cut embroidery on the skirt portion?